"Interesting character development wrapped in a dull package"
This was strange Arrow episode for me, in that it wasn't particularly interesting but still managed to achieve its secondary goals. While the villain of the week (or, rather, returning villain of the week) left me cold and the main thrust of the episode was pretty dull, "Beacon of Hope" was able to spotlight the show's secondary characters to great effect, fleshing out some people who haven't had a chance to shine lately. In all of the mess with Damian Darhk and the broken engagement, Arrow has spent the last few weeks rehashing the same major plot points over and over, which is a trap shows with traditional 22 episode seasons often fall into. And while those two elements were still present in this week's offering, they managed to take a back seat to the development of Curtis Holt, as a viable Felicity fill-in (with shades of his Mr. Terrific future identity starting to show a bit), and additional development of Felicity as her own person, separate from her identity as a member of Team Arrow and Oliver's fiancee. I've really enjoyed the addition of Curtis to the show this season. Yes, his hyper personality can be a tad grating at times (particularly when Felicity is also acting manic alongside him), but on a show that tends to spend a lot of time focusing on its dark and brooding leading character, it's nice to have some levity around. I also have enjoyed how the show has been slowly hinting that Curtis has more physical skills that one might initially think. Yes, he's a Olympian, but the show has placed a lot of its focus on his mental capabilities over his physical. Yet, when faced with a killer bee coming at him, Curtis is able to seamlessly flip out of the way and over a table- which might come in handy down the line when he eventually begins his own superhero career. The other highlight of the episode was seeing Felicity take charge and lead. 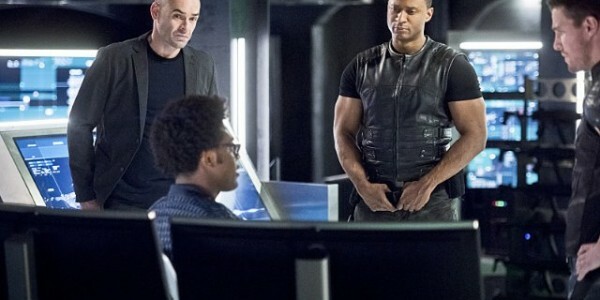 Yes, Felicity has always been a capable character on the show, but she's rarely given the chance to lead on her own and get out from behind a computer. 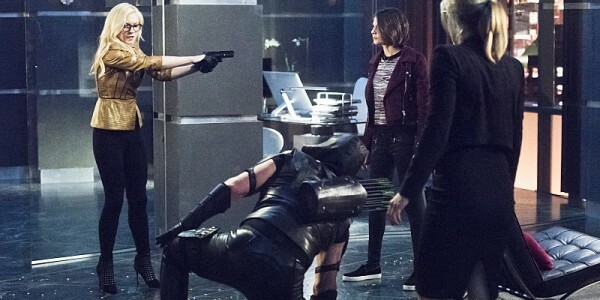 I expected Thea to take the lead when it came to devising a plan to escape the bees, but seeing Felicity rise to the occasion (with only nominal freaking out in the process) signaled a major step for the character. During her relationship with Oliver, Felicity was relegated to girlfriend or Team Arrow control center operator, which was perfectly fine. But it didn't allow Felicity to take action on her own. "Beacon of Hope" allowed Felicity to get back in the saddle and realize that she has the ability, on her own, to make a difference. While I would love to see her back in the fold of Team Arrow (and Thea made a really strong argument for it, without ever mentioning Oliver as a reason, which was great as well), giving Felicity a chance to grow outside of her comfort zone will be really nice to see. Finally, I would be remiss if I didn't touch on the final scene of the episode, which revealed that Andy Diggle might not be the reformed angel we were led to believe. I'm not sure how I feel about this twist. On the one hand, it gives a character we spent a lot of time introducing an interesting new wrinkle, but on the other, it is pretty lazy from a story standpoint. There have been zero hints (at least that I have noticed) that Andy is still in contact with Darhk. It would have been nice to see this organically developing. Sure, I suppose he could have pulled the wool over everyone's eyes throughout the course of the season, but I can't imagine Team Arrow was that blind. Perhaps it was simply a case of John overlooking the signals because he was so glad his brother was back? Either way, this twist needs to pay dividends, because so far the entire Darhk arc has been a dud. Final Thoughts: -- Captain Lance cracking jokes is my favorite Captain Lance. -- It looked pretty darn easy to get into the Bunker once you find the secret door. Someone should look into that. -- I really loved Emily Kinney (Brie Larvin) during her time on The Walking Dead, and it's always nice to see her try on some comedy. But man, was that dialogue stilted and lame. -- Another strong appearance from Mama Smoak. They've really found the sweet spot for that character. -- I'm a fan of this Laurel-Oliver friendship. She seems to be the only one willing to call him on his BS. Even more impressive, it also appears to be getting through his thick skull.